shows in between. What's unusual about this one is that the prime-time show it's based on is, itself, based on an earlier cartoon. The Addams Family came out of a series of panels by Charles Addams, which ran in The New Yorker for several decades, starting in 1937. The sitcom, which originally aired from 1964-66, was proving popular in syndicated reruns. Like I Dream of Jeannie and Batman, its characters were licensed by the Hanna-Barbera studio to guest-star on what was then their leading show, Scooby-Doo. 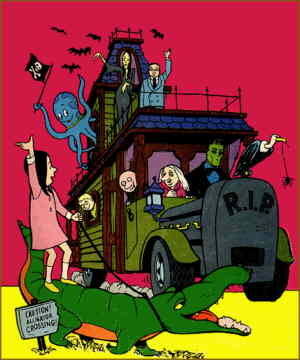 The Scooby/Addams crossover appeared in 1972, and made such a hit, Hanna-Barbera produced a regular half-hour Addams Family Saturday morning series. The series debuted September 8, 1973, on NBC. Sanitized and satmornized, this series bore only a superficial resemblance to the creations of Charles Addams. It kept to the general theme of ghoulishness, but here, the macabre elements seemed more like a schtick than an outward expression of truly twisted souls. Their creepy old Victorian mansion was remodeled into a creepy old Victorian mansion-like vehicle, in which they traversed the land, getting involved in the lives of various people they met. And of course they had pets — tho at least they opted for an octopus rather than a puppy, and their cat was considerably larger and more obviously carnivorous than most. Lennie Weinrib (Inch High, Private Eye; various voices in Smurfs) provided the voice of Gomez Addams, and Janet Waldo (Penelope Pitstop, Judy Jetson) did that of Morticia. Jackie Coogan and Ted Cassidy repeated their roles from the live-action version. Another notable voice credit was Jodie Foster as Pugsley. This series lasted all of 13 episodes, each of which was aired over and over during the two years the network carried it. It's been re-run from time to time, most recently on Cartoon Network. It also spawned a comic book version, published by Gold Key, which began with an October, 1974 cover date and ended with #3, dated April, 1975. Hanna-Barbera produced a second Addams Family series, 1992-93, this one lasting 16 episodes. It resembled the original a little more closely, but with parent action groups still wielding some of their old power, still wasn't able to delve into the characters' true weirdness. Voice actors in this one included John Astin reprising his 1960s role as Gomez, with Nancy Linari (several voices in Sonic the Hedgehog and Duckman) as Morticia, Jim Cummings (Darkwing Duck, Tasmanian Devil) as Lurch and Carol Channing (Mehitabel, several voices in Where's Waldo?) as Granny. As robust as the Addams Family franchise is in live action — two TV series, a special, three movies, and endless syndicated reruns over a period of nearly four decades — both animated versions seem rather puny and insipid. The only cartoons that ever truly depicted The Addams Family are the ones drawn by Charles Addams himself. Text ©2001-06 Donald D. Markstein. Art © Hanna-Barbera.